Customize these Dog shaped keychains, order it and we will materialize to you with 3D printers. Personalise with your favorite name, nicknames or any other fun messages or placing patterns (engrave or emboss) to smarten the keychains. Do it Yourself (DIY) because custom keychains make a lovely and creative gift anytime against mass products. What kind of dog keychain do you want? Keyring for Sparky, Paw, Teddy? No, no, rather to the owner! A real personal gift for any dog owner! Let the dog name be anything, no matter what we will 3D print it. And should you give it to the dog he can even put his name on his dog collar! Do not skedaddle should you not find your favourite dog breed – to satisfy individual needs any breed of dog is pre-designed by our designers upon request! 3D Printed Dog Keychains. This could be a special, creative gift for kids or anybody who likes dogs. Nowdays a modern keychain is not only a practical way to keep keys together but a trendy and fashion accessory. 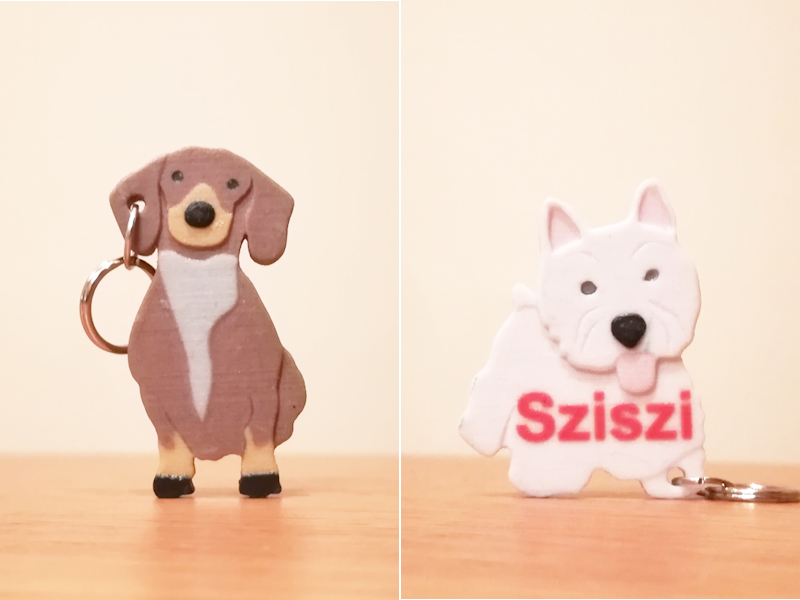 These style of 3D printed key rings can show your love to your favorite dog. It doesn't matter that small or big, quiet or fearless they are always your amazing friend and these fun and useful key rings always will remind them.